Well, you knew we were there didn’t you, because my last action packed post left us with full bellies for our first night. Today was our first day of exploring, so we were super excited. We did have a slightly lazy start though as we were both pretty tired from our travels so far, and besides, it was pouring rain during the morning… so waiting until midday was not a bad move. When we ventured out the last of the rain was pattering and in no time at all clear blue skies were the order of the day. We had a bit of a plan, mainly because of when things were open and closed. 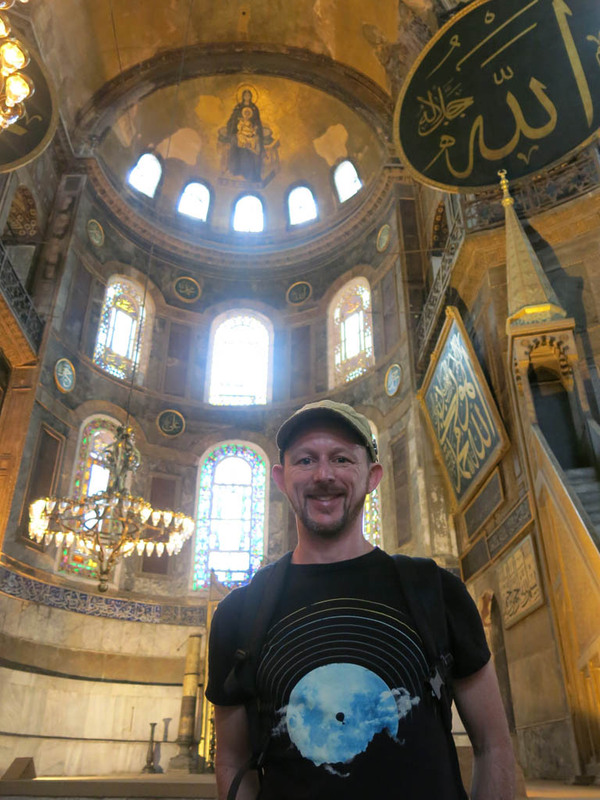 With Aya Sofya closed Monday, and the Grand Bazaar closed Sunday, we decided to check them out on our first day of wandering. A quite long, but fast moving queue greeted us at Aya Sofya, but in no time at all we were inside. 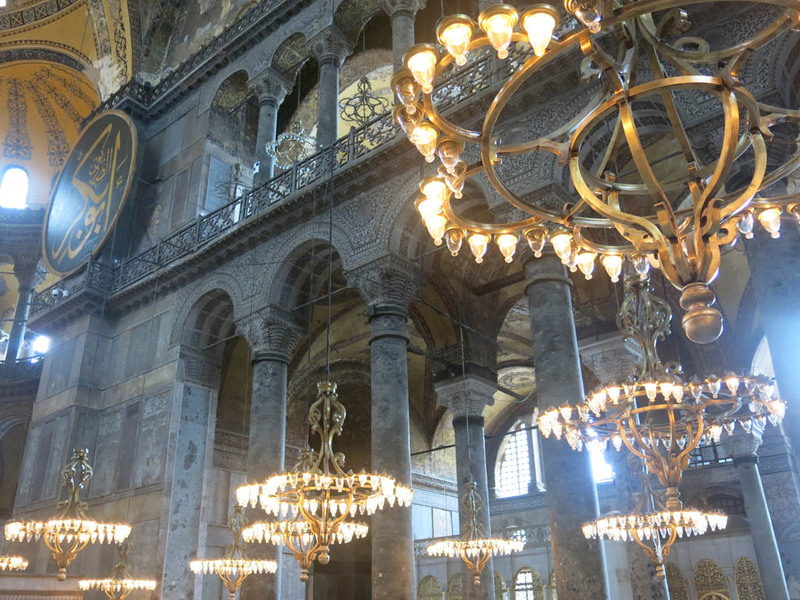 Aya Sofya is a fascinating one. 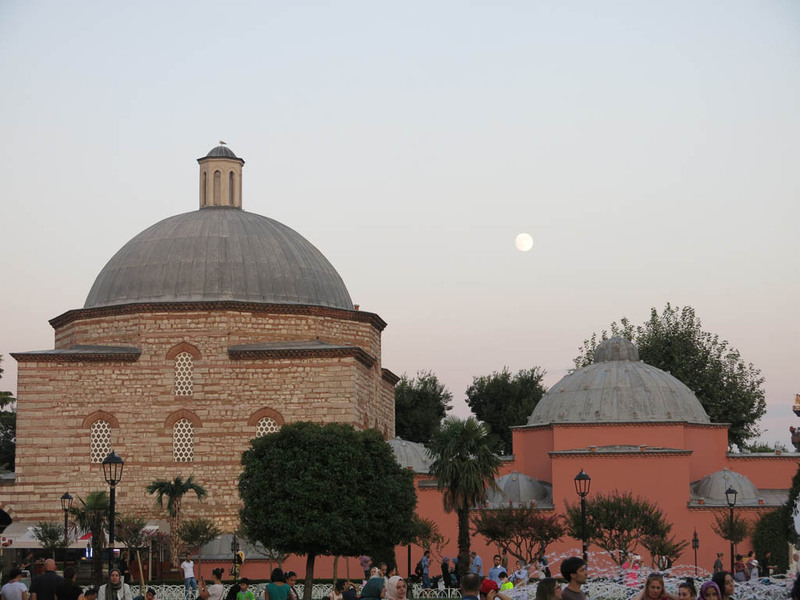 First it was a church, then it was a mosque, and now it is a museum. Originally built in the 500’s, it is only in the last century that it lost its religion (so to speak) to greet everyone. It was quite an interesting experience heading in. First of all, unfortunately a giant array of scaffolding hid the view of one side of the main room. I guess these things have to stay in order, so we can’t complain. Besides, the rest of the interior was quite spectacular. In some respects it was probably a bit rougher round the edges than either of us expected. It seemed there was quite a lot that was fading, parts where it looked like things had been torn off the walls. But our place gets messy in weeks, let alone millennia, so who am I to judge? We did find the Wishing Column in our wanders. This was a column with a thumb sized hole in it, that, if your thumb comes out wet, grants you your wish. Both Kate and I tried and at best our thumbs were a little moist, but I’ll take that. Infinite wishes please! So we just wandered around the main room with the masses, soaking it all up. We also went upstairs for some cool views of down below. Up top were a number of old mosaics in various states of disrepair. Given that many other centuries old pieces down below were just open for everyone to touch I wonder how long before they really try to keep most things off limits? The good part of a couple of hours went by with our wandering and we were getting a bit peckish. 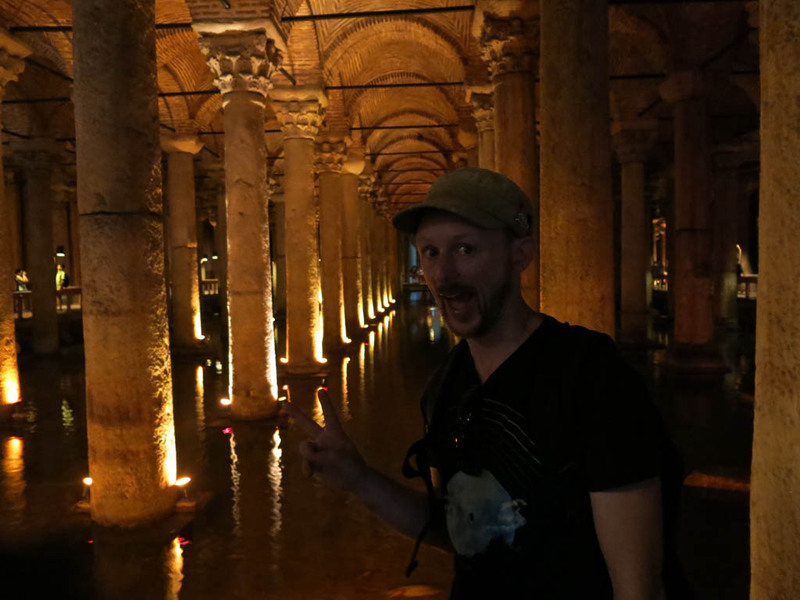 Bt before we decided to eat, we decided to pop in and check out the Basilica Cistern. A huge underground chamber, this was built in the 6th century, where it was then used for centuries to provide water to the nearby palace. But we all know that the most famous use for the cistern was in From Russia With Love don’t we Bond fanatics? Awesome huh?! We thought it was hilarious! 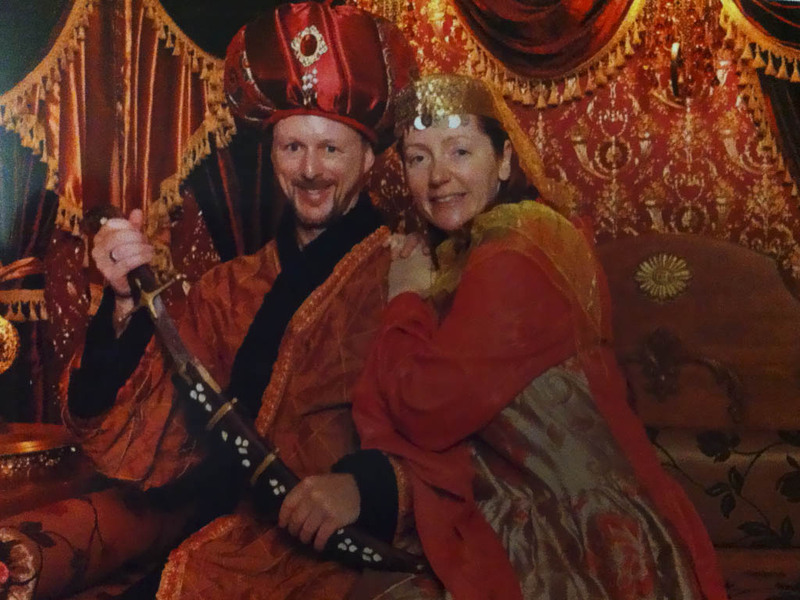 And now we have a cool photo for our house to remember dressing up in traditional Turkish costume in an underground cistern. Of course we do. Most the columns are identical with a handful of exceptions. One is the Weeping Column, which is not hard to guess why from the dozens of eyes adorning the column. 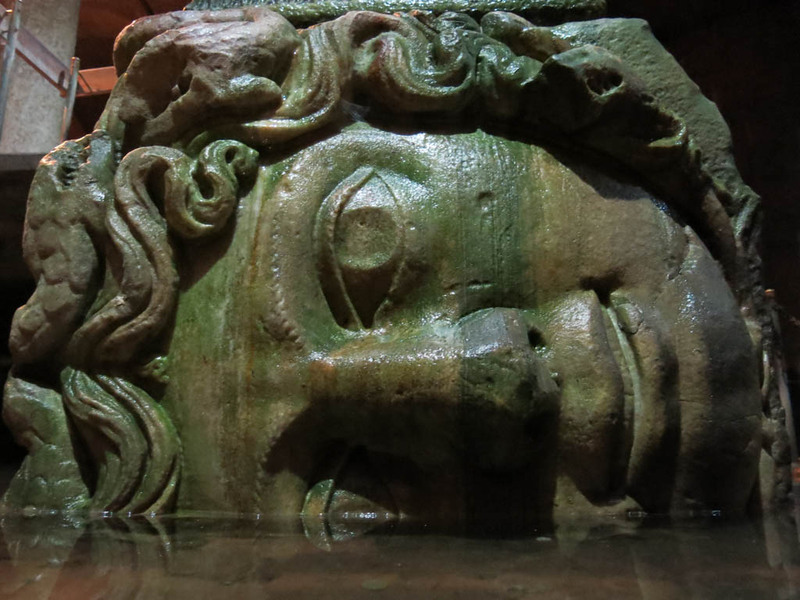 medusa! don’t look at her! 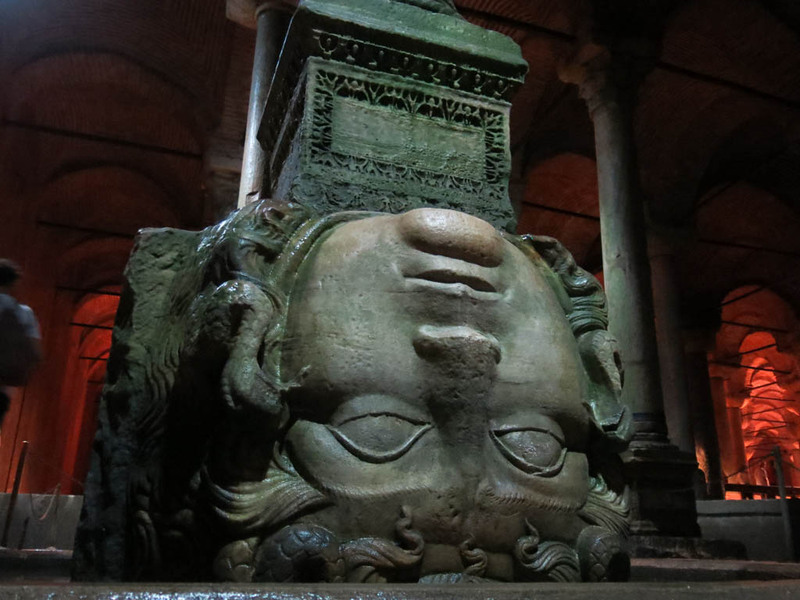 The main things people love to see in the cistern though are the Medusa heads that hold up two columns. It seems that no one really knows why they are there and why one is upside down and the other on its side, but apparently it was deliberate. They look cool as heck though. With the dim lighting and the water, you can get some really cool and creepy photos of them! By this time we needed some sunlight and food, so grabbed a bite to eat at the cafe nearby. Mmm… meat and spinach pide. Yum. Sorry, no pic of this food. Sure there will be more soon. 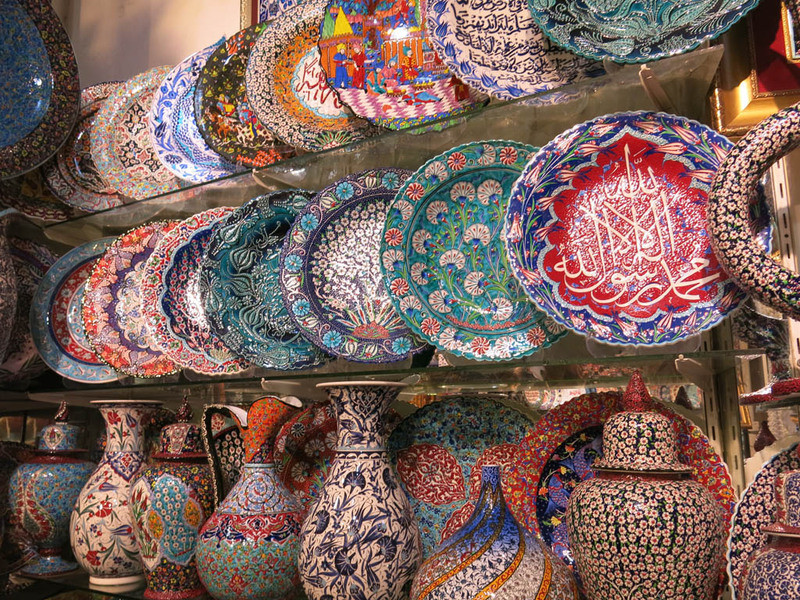 The day was creeping away, so we decided to head to the Grand Bazaar for a look. We weren’t intending to buy much, as we didn’t want to spend our money early and lug things all around Turkey. But we just wanted to soak up the experience. Inside it was a weird mix of shop shops, antique shops, cheap knock off shops, and high end jewellery shops. There seemed to be something for everyone (well, except me… I tried hard to find LP’s but alas no luck). The place was a huge rabbit warren, and getting lost in there was easy. So we just cut some laps around and around. We engaged in some haggling and Turkish tea, and did what everyone does. Many of the shopkeepers don’t like you taking photos of their shops, but pictures can’t capture the bustle of everything going on. In the end, we got some small bits and pieces, but the main shopping would have to wait for our return to Istanbul in a few weeks. With our heads overloaded with shops and shopkeepers hassling us every 5 steps, we were about done. 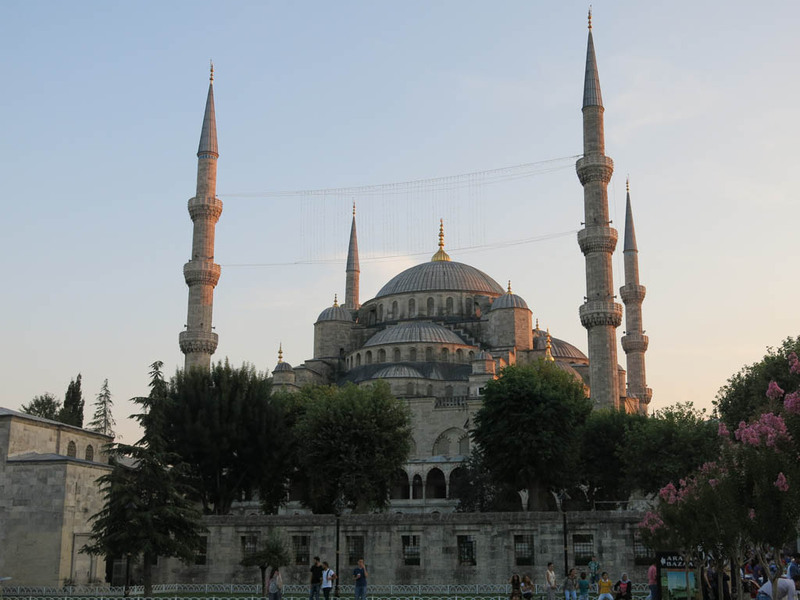 We decided to casually stroll via some parks back to the area of Aya Sofya, and also the Blue Mosque. It was prayer time, so we could not look inside the Blue Mosque. That would have to wait until tomorrow. But we just sat in the grounds, eating some corn on the cob, and soaking up Istanbul. As the sun started to set and the moon appeared, the full moon became visible in the skyline. Things are pretty sweet here in Istanbul.